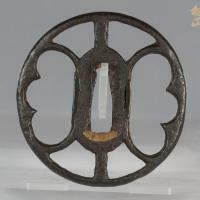 This is a wonderful Kanayama tsuba which has been changing hands between well-known Western collectors for several decades. See Jim Gilbert collection as another reference. This is a text-book example, small in diameter with very thick rim, dished plate and lumpy tekkotsu. The colour is blackish and the surface looks wet and lustrous, typical for Kanayama and Owari sukashi tsuba.